In a Chicago restaurant, Grifter and his lover carry out a stakeout as they watch a meeting between two powerful new criminal armies. One group of the armed men, led by a Russian assassin called Spetsnaz, opens fire on the other and eliminates their opponents utterly. The covert operative acts to prevent the slaughter as members of the police department arrive. Dragon joins forces with the mysterious hero but they cannot capture the insane villain, nor his enigmatic partner, Max Proffit. The aftermath of the battle reveals that Alex Wilde has been badly wounded and she is rushed to Hillman Hospital for treatment. This injury to his partner causes Dragon to question his recent ally into the nature of his involvement but the freak is ordered away by the special operative, Alicia Turner. Grifter then attends a secret meeting with a possible ally in Max Proffit, who just happens to be the hero’s younger brother and a deep cover I.O. agent. The siblings agree to come up with a plan to bring down the new crimelord vying for a portion of the lucrative property controlled by the Vicious Circle. The armored villain known as Demonseed reveals himself to be the criminal mastermind in question as he orchestrates an arms deal that will give his army superior weaponary in the coming gang war. Max Proffit is discovered to be a spy and he is quickly turned upon by his allies, only being saved by the timely arrival of Dragon and his own brother. A huge gunfight erupts in the warehouse holding the arms shipment and Demonseed takes the opportunity to flee with his freedom intact. Spetsnaz attempts to follow on a boat, with the acquired weaponary but Grifter uses an experimental rocket launcher to blow up his vessel. The two brothers part company and are both thanked for their recent efforts by Dragon, who has prevented mass bloodshed by avoiding open gang warfare. 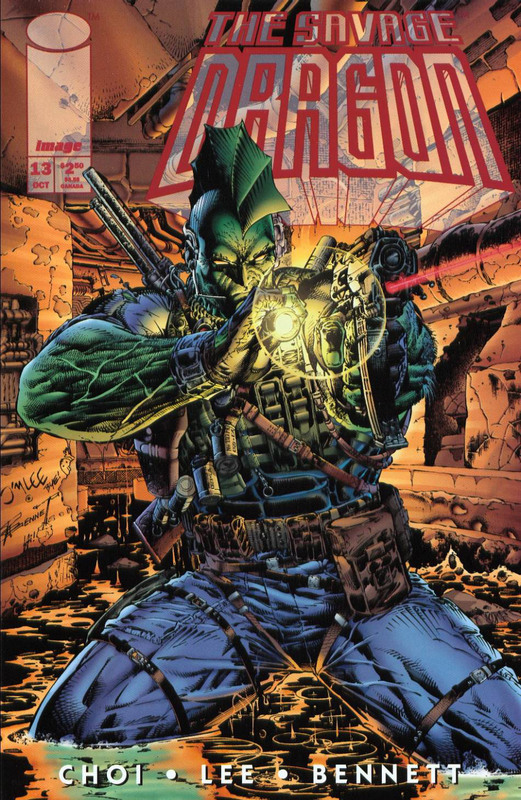 This takes place before WildC.A.T.s #14 and Erik’s version of Savage Dragon #13.